Bhola and his wife are daily wagers working at a road construction site. Close by, under a tree, their infant son sleeps in a cloth hammock. Once in a while, Bhola's wife checks on the little one. They also have an older son. But he is not here. He lives with his grandparents in the village and attends school. The construction will be over in another fortnight, after which the couple will leave for their village. Happily, it will be around harvest time and they will be able to find some work there as well. Bhola and his wife are typical of the migrant rural workers who come to towns and cities during the lean period when there is little or less work available in the rural farms. From the mighty construction industry to the roadside dhabas, migrant workers are absorbed into the city life in a hundred different ways and keep the city ticking the way it does. Yet, for a majority of these workers, the tale is one of desperation, hardships, harassment and exploitation. Here is where Udaipur-based NGO Aajeevika Bureau hopes to make a difference. Ajeevika is a specialized organization, which offers education and training to poor rural laborers and migrants and then places them in jobs with decent wages and fair working conditions. It all started with a study on livelihood opportunities in rural Rajasthan, conducted by Sudrak and ARAVALI (Association for Rural Advancement through Voluntary Action and Local Involvement), two NGos based in the state. Rajiv Khandelwal, co-founder and alumni of IRMA (Institute of Rural Management, Anand) says, "We found that the workforce that depended on agriculture alone was diminishing rapidly. Most rural households, in fact, resorted to the strategy of short-term migration to augment their earnings." "We found that the state of the migratory population we abysmal, and there seemed to be an urgent need for intervention," says Khandelwal. There was a need not only to train and educate the workforce by offering short term intensive courses, but also for other services that could take care of the vulnerable section, namely, women and children who would be left behind by the migratory worker. 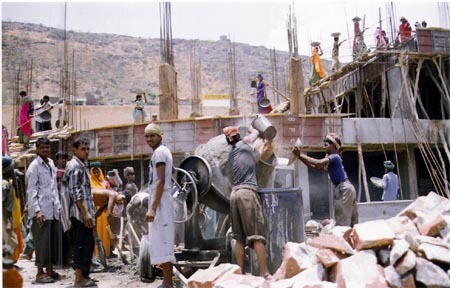 Aajeevika has focused on the rural population of south Rajasthan entering the labor market in Gujarat, Rajasthan and Maharashtra. Aajevika gives them training in work required by the hotel and tourism industry, and by the construction industry, such as masonry, carpentry, plumbing, house wiring and welding. Training is also given in chores required to be done in urban households. These training sessions are intensive residential ones, spanning two to three weeks. Such formal training has its advantages. Sevaram Gameti of Gogunda district, for instance, graduated from being an employee at a local electrical shop to a full-fledged small-fittings contractor after he underwent training as an electrician with Aajeevika. The hotel industry, with its need for trained waiters and room service personnel, has provided some success stories as well. Khandelwal names some prominent hotels in Udaipur where some of the Aajeevika-trained men have been placed. Shankarlal of Chilpal village is one such person. From being a cleaner at a bus canteen, he went on to be employed as a waiter with a prominent restaurant in the city after he was trained with Aajeevika. Women migrant workers have been trained to work as full-time domestic help in homes in Udaipur. The training focuses on cooking, child-care, personal hygiene, professional ethics and use of home appliances. But being a completely informal sector, with no set rules, placing women as domestic helps has not been that successful, says Khandelwal. Aajeevika also maintains a database of migrant workers, especially with regard to their profile, skill and the city to which they migrate to work. A photo-identity service too has been initiated. The migrant's photo, address, skill and emergency phone number is listed in the card, which is attested both by Aajeevika and by the sarpanch of the village where the worker lives. "The photo identity card is useful in checking the bona fides of a worker, when s/he applies for a job and prevents harassment in a city. Also, in case of any emergency, it is possible to trace the worker's family." Since it started two years ago, Aajeevika has trained about 200 and registered 1,000 migrant workers from five blocks of south Rajasthan. Among other schemes, Aajeevika has plans to grant small loans to migrant workers and provide supplementary education. Says Khandelwal, "Migration is a reality that cannot be wished away. The conditions in the rural areas often leave the poor with no alternative." What can however be done is to make such migration safer and restore to the migrant worker his/her dignity. This is what Aajeevika does.